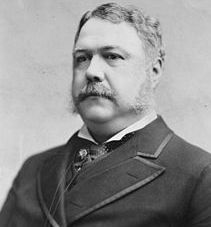 New York lawyer Chester A. Arthur is appointed by Gov. Edwin D. Morgan as Engineer-in-Chief of the New York State Militia. The future 21st president of the United States (1881-1885) would serve in political appointments during the Civil War. On April 4, 1862 he was appointed Inspector-General of the New York State Militia, then – on July 22 – Quartermaster-General. The positions carried the rank of brigadier general, and Arthur was responsible for raising, equipping, and dispatching state troops for the Federal government. He stepped aside from these duties in 1863, and after the war returned to law practice in New York City. As a child, Arthur attended Baptist churches. His father, William, was an immigrant Baptist preacher from Ireland. A committed abolitionist, William pastored a number of churches in Vermont and New York while Chester, his oldest son, was young.